According to Peter Drucker, “There is nothing so useless as doing efficiently that which should not be done at all.” Stop overcommitting yourself to activities that don’t bring you closer to achieving your goals and instead, eliminate them. Audit your calendar for recurring activities that do not support your goals. 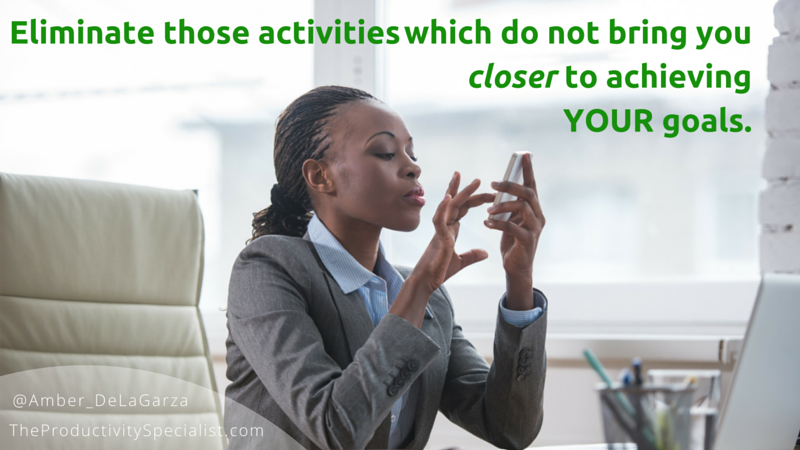 Whether a meeting, class, project, or event, identify which activities are unnecessary and eliminate them. Those hours filled with non-valuable content add up to days’ worth of time that could be repurposed. Eliminate items from your own task list that can easily be completed by someone else. Delegating is essential to freeing up time to spend on your highest priority activities. Don’t waste an hour picking up dry cleaning when your assistant could make the drive. Put your time to better use on a task that only you can complete. If you can minimize or eliminate the activities you do as part of your daily work routine by just 15 minutes, you can reclaim a total of 65 hours per year for activities that align with your goals. Now that’s a perfect reason to stop wasting time on pointless activities! Interruptions occur when a person purposefully draws your attention away from your current task or activity and cause a lack of focus. The average office worker is interrupted 73 times a day while the average manager, every eight minutes! (CubeSmart Inc. “Social Interruption and the Loss of Productivity.” 2002.) While controlling the actions of colleagues, employees, and vendors is not possible, managing interruptions is because you can control how you make yourself available to them. Post open office hours. Express that these are the hours you’re available for questions, concerns, or chit-chat. 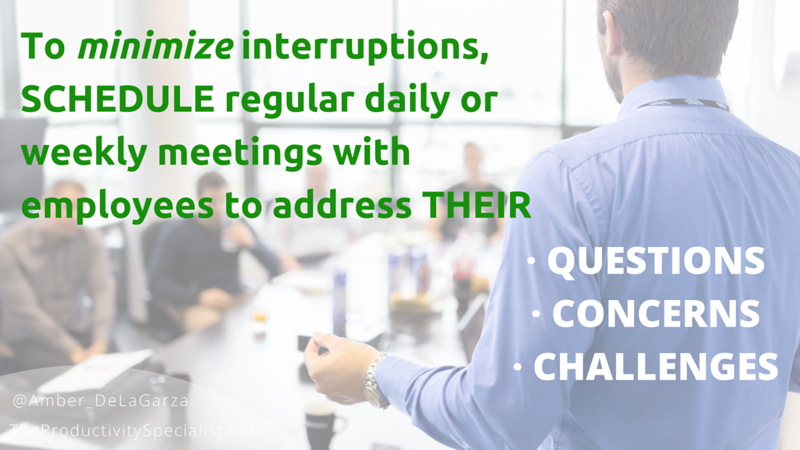 Schedule regular daily or weekly meetings to address employees’ questions, concerns, and challenges. Do whatever works for your business and remember to give yourself an appropriate amount of time to tackle all of their needs. Distractions include anything that breaks your focus from the task or activity you are working on. Internal distractions occur when you purposefully shift your focus from one task to another, such as giving in to the temptation to check your social media account during work hours. External distractions are disruptions you are aware of but don’t directly involve you, such as people talking in the distance, co-workers walking by your desk, the phone ringing, and audible notifications. Focusing strictly on one task for a long period of time can be difficult so try working on one task for a predetermined, manageable about of time instead. Start with a 15-minute block of time devoted to no internal distractions then increase to 20 minutes. Take a short break at the end of each time block. Continue increasing the length of your time blocks until you find your optimal focused work time. Turn off all unnecessary notifications that tend to disrupt concentration. If you’re unaware your phone just received a text, you won’t be zapped out of your focus zone or feel the need to respond it. Go to Settings and switch those alerts off! To reach new levels of success, you must proactively support your ambitions by investing your best time into your best activities. To do so, make an effort to rescue the minutes, hours, and days lost to inefficient uses of it. After all, small distractions and pointless activities amount to giant gaps in productivity. Strategize to invest your time more wisely by minimizing distractions, managing interruptions, and eliminating wasteful activities. Reclaim your most precious commodity and reallocate that time to the activities that will launch you toward your goals and vision of success. activities that align with your goals.